Handheld radios might seem a bit archaic, but in an emergency situation, few things will keep you as reliably connected to the outside world. This Emergency Multi-Function Radio & Flashlight takes the utility of the tried-and-true radio and combines it with a powerful flashlight and self-sufficient energy system. It's available in the Boing Boing Store for $28. In addition to its bright, built-in LED flashlight, this multi-functional radio features a large solar panel on top and a hand crank, so you can charge it without batteries. It's handheld and easily packaged, making ideal for packing away in an emergency kit. And, it can even charge USB devices via the onboard battery. 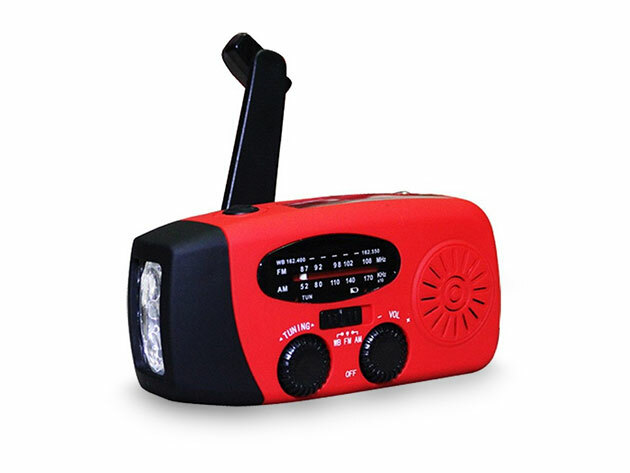 You can shore up your disaster-relief kit with the Emergency Multi-Function Radio & Flashlight, available in the Boing Boing Store today for $28.